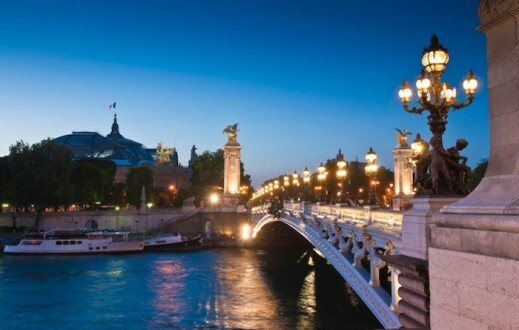 On any travel adventure, it’s nice to experience a balance of seeing historical sites, typical tourist attractions and then some outdoor adventures. 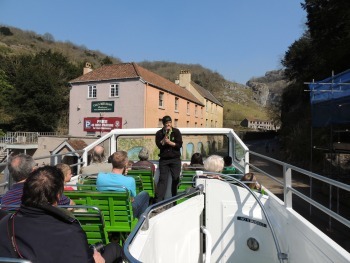 If it’s time for some back to nature fun, then Cheddar Gorge is the place to visit in England. The countryside, with its 450-foot natural rock formations creates a breathtaking gorge as you drive to the town aptly called Cheddar. 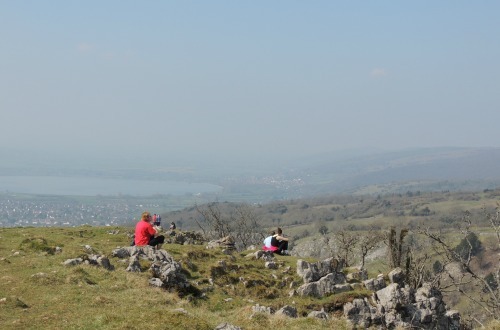 You are visiting Cheddar Gorge after all! The gorge has been designated an “Area of Outstanding Natural Beauty” and doesn’t disappoint. An all-inclusive admission ticket gets you into both Gough’s Cave and Cox’s Cave. We particularly liked Gough’s Cave because of the fun and informative headphone narrative. Instead of a boring lecture on the calcification level of rocks, we listened to a lively narrative from a man who supposedly lived in the cave. He even had his wife share some of her opinions of the experience! Walk through the cave at your own pace. The paths are wide and well lit so it doesn’t feel claustrophobic. Guess what is stored in the cave? Large rolls of cheddar cheese because the cave is so cool–literally, not figuratively–and the temperature stays consistent year-round. While the caves are certainly not as large as Carlsbad Caverns or any of the major US caves, they provide a great perspective on what exists underground. One man commented, “I’ve never been in any sort of cave, so this is an amazing experience for me.” Even more amazing is the fact that people used to live in the caves. The skeleton of “Cheddar Man” is on display as the country’s oldest human skeleton. Cox Cave offers a twist on the traditional stalagmite and stalactites cave tour. Instead of focusing on the rock formations, the cave tour begins with a “Floating Head” explaining that you are on a Crystal Quest. This involves embarking on an adventure filled with mystery and intrigue. Older kids will enjoy moving along the pathway to encounter strobe lights, elves and fire-breathing dragons. At the end, touch the glowing Crystal Ball to save the world. I touched it, so the situation in the Middle East should soon be over. There are hikes and then there are hikes on top of the gorge. This three-mile trail starts with climbing Jacob’s Ladder. 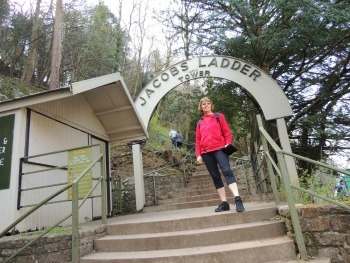 Not sure why it’s called Jacob’s Ladder since there’s no ladder in sight, just 128 steep steps. 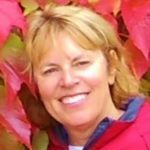 Very grateful for the three resting stops along the way! Once you’ve conquered the steps, there’s a lookout tower to strain your knees even more. Your admission pass includes a ride on the open-air double-decker bus. As usual, kids raced to the top to experience a “high” bus ride. A tour guide encourages you to look skyward as he explains the breathtaking rock formations. Since the canyon is narrow, and the rocks are steep, you feel very insignificant riding along in a bus surrounded by high walls. The ride is short, and I did overhear a few people comment they would have liked a longer tour. The area around Cheddar Gorge has several RV campsites. The Burnham-on-Sea Holiday Village is an RV park loaded with fun family activities. The campground offers a circus school, Wacky Olympics, sports camps, Splash-Zone pool, bike and cart rentals, talent competitions, Wizard of OZ family interaction shows and more! Cheddar Gorge is a nice break from seeing churches and museums where children are expected to be quiet and keep their hands to themselves. The caves allow you to wander at the speed you want and the hike certainly should help kids use excess energy. If you’re interested in even more activity, rock climbing and caving adventure programs are available on a regular basis. I observed many families simply strolling around, enjoying the myriad of ice cream shops and tea rooms. Don’t forget. You are in England where afternoon tea is almost a requirement. And of course, since you are in the town of Cheddar, you can’t leave without buying authentic cheese…cheddar cheese of course!